I was recently contacted by the company Waste Management with an important issue that I want to address. Waste Management makes SAFETY a priority when handling community waste. Although some people may look at a DUMPSTER as providing options for more than just the disposal of trash, please note that dumpsters are pieces of HEAVY INDUSTRIAL EQUIPMENT, serviced by HEAVY TRASH TRUCKS with HYDRAULIC CRUSHING EQUIPMENT. IF A PERSON IS INSIDE A DUMPSTER WHEN IT IS EMPTIED INTO A TRASH TRUCK, THERE IS A SIGNIFICANT RISK OF INJURY OR DEATH TO THAT PERSON. Waste Management requests that you PLEASE STAY OUT OF WASTE DUMPSTERS, for your safety, and for the safety of our drivers and helpers. That way, together, we can avoid any unintended mishaps. Here are some recent news stories regarding incidents where people were found in waste dumpsters. - Two people were killed by compaction in a garbage truck. In both cases, the victims apparently climbed into a dumpster to sleep and were emptied with the contents into a trash truck. Compaction of the victims with the load led to death. 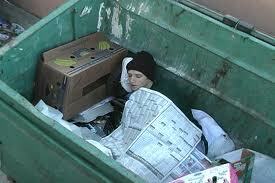 - A homeless man was crushed while seeking shelter from the rain in a dumpster. The victim, 44, was dumped into a trash truck and crushed repeatedly before a sanitation worker finally heard his screams and spotted him. - Police identified a man whose body was found in a dumpster. They believe he crawled into a dumpster and was crushed to death after the truck picked up the load. - Workers at a trash transfer station found a man's body yesterday while sorting trash. Police believe the man was sleeping in a dumpster near two homeless shelters. - A woman searching for aluminum cans in a trash bin was dumped into the back of a trash truck when the driver emptied the bin without realizing the woman was inside. The truck driver was about to press the compacting button when he heard her screams. - Police have identified the body of a man in a dumpster that had been picked up and its contents crushed by a trash truck. Police believe he had gotten inside a dumpster to keep warm Friday night or early Saturday morning when the trash truck came and picked up the dumpster. Police say the driver of the truck would have had no way of knowing the man was in the dumpster.